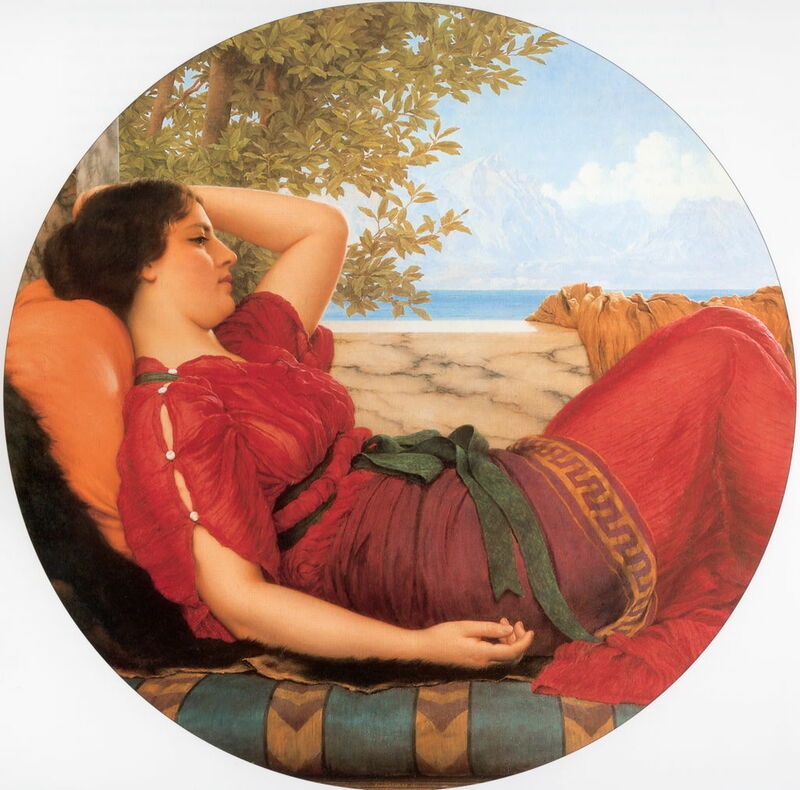 John William Godward (1861–1922), In Realms of Fancy (1911), oil on canvas, 39 cm diameter, Private collection. Wikimedia Commons. One of the commonly-quoted propositions of the Aesthetic movement was that painting could become more like music, which was argued to be a purely sensory experience, without narrative or ‘meaning’. 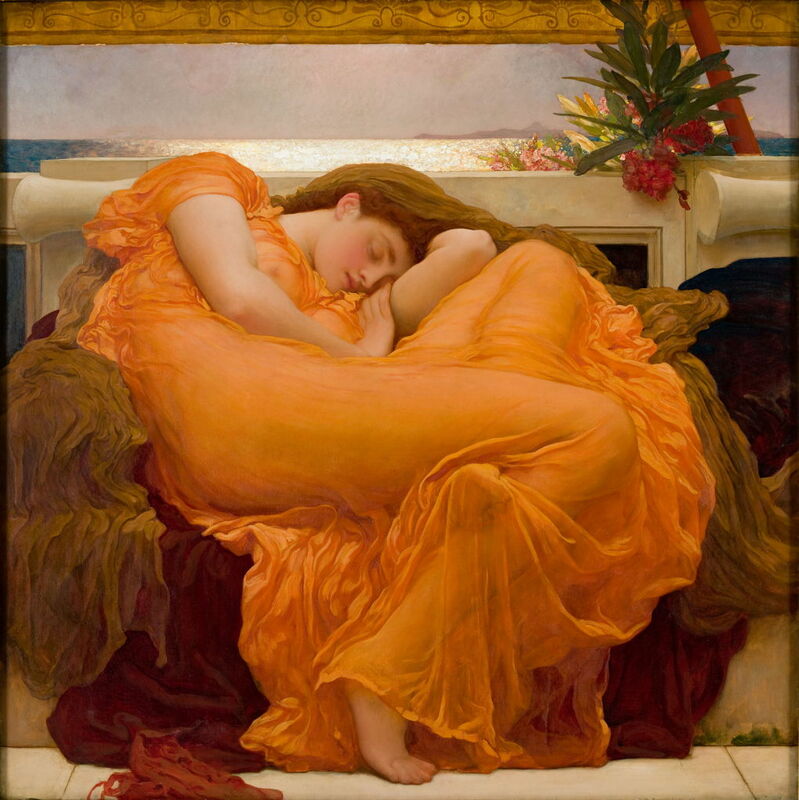 Although other artists explored that idea from the late 1850s onwards, and it is well-illustrated in Frederic, Lord Leighton’s Flaming June (1895), most painters avoided the goal of ‘pure art’ painting. Frederic, Lord Leighton (1830–1896), Flaming June (c 1895), oil on canvas, 120.6 × 120.6 cm, Museo de Arte, Ponce, Puerto Rico. Wikimedia Commons. 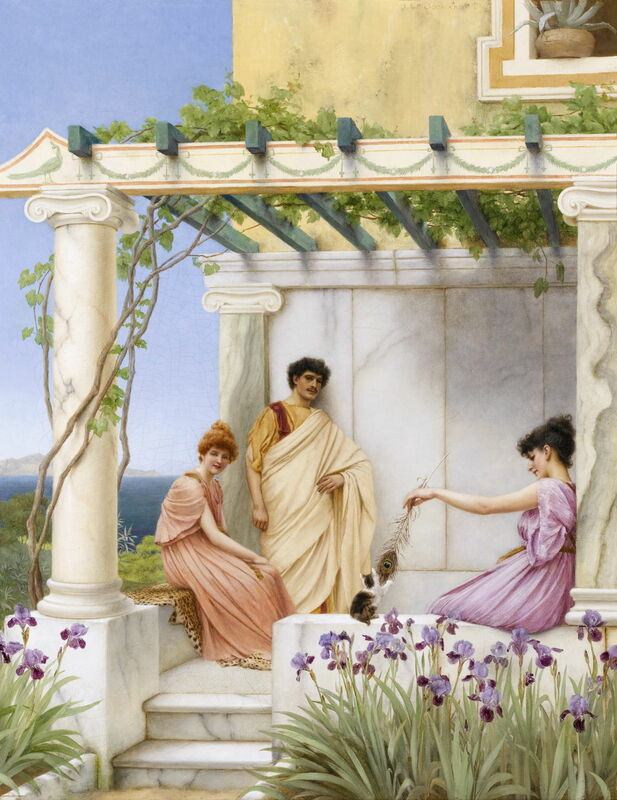 One of the last neo-classicist painters of the Victorian era in the UK who made a career out of such ‘pure art’ works was John William Godward (1861-1922). Very little is known about his life, because he was estranged from his family for much of his career, and his papers were all destroyed on his death. Likewise with his paintings: because he avoided the use of symbols, or narrative, there is remarkably little to say about most of them. We must therefore rely on his paintings to do whatever telling they can. Godward was born in Wimbledon, south of London, and nothing is known of his training. He does not appear to have attended the Royal Academy Schools, nor to have trained outside the area of London. It is probable that he attended part-time classes at one of the art schools or groups which had become numerous at the time, and that much of his painting was, to a degree, self-taught. His earliest known paintings date from about 1880, but it was not until 1887 that he first started exhibiting at the Royal Academy. 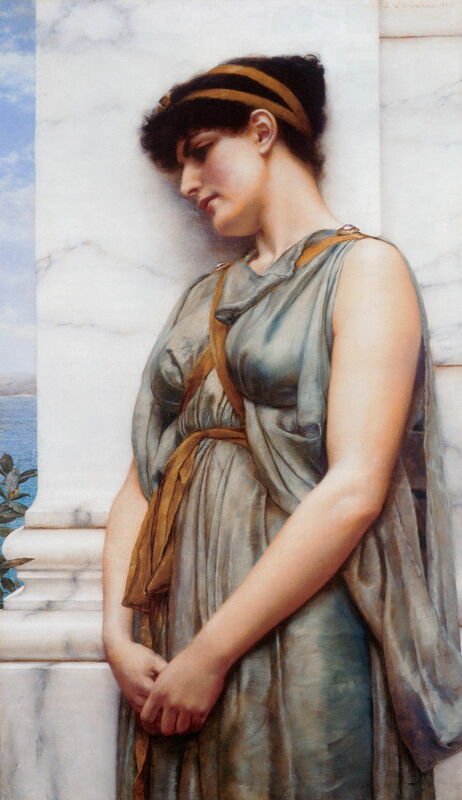 John William Godward (1861-1922), Grecian Reverie (1889), further details not known. Wikimedia Commons. 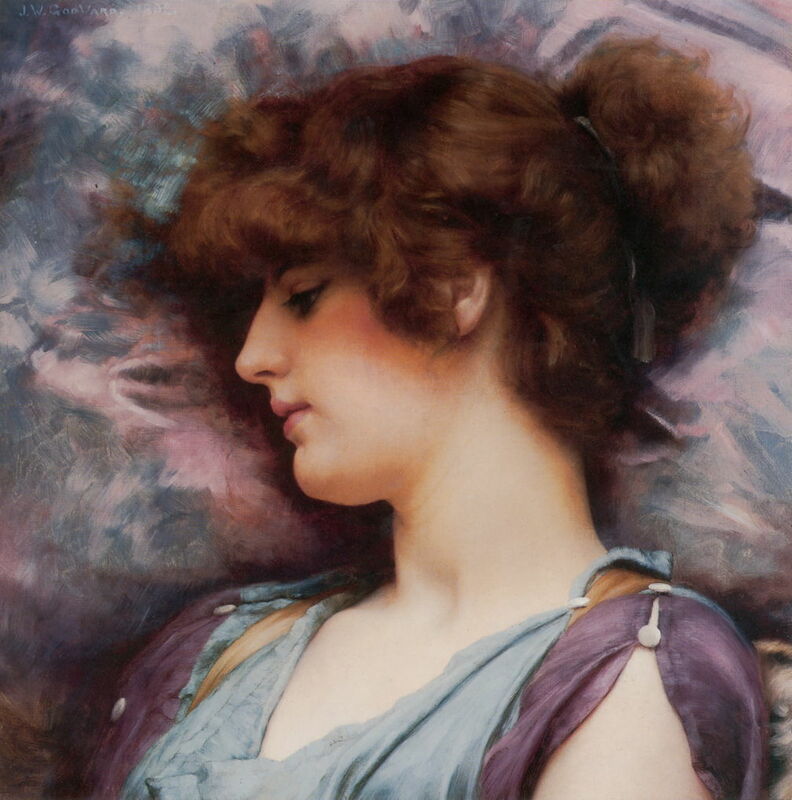 He soon established himself in similar style to Leighton’s later Aesthetic works, such as Flaming June (1895), expressed using the marble of Alma-Tadema. However, it is not known whether he ever had much contact with those artists. Grecian Reverie (1889) is his parallel to the paintings of Fanny Cornforth by Dante Gabriel Rossetti. However, they lack the emotional intensity and complexity, and their settings are rather bland marble buildings. John William Godward (1861-1922), A Priestess of Bacchus (1890), oil on canvas, 29 x 45 cm, Private collection. Wikimedia Commons. A Priestess of Bacchus (1890) is another good example of the gap between the likes of Leighton and Alma-Tadema, and Godward’s plain marble. Apart from the characteristic thyrsus (the staff topped with a pine cone), there is nothing to relate to Bacchus, or the activities of such a priestess. The distant landscape is strongly reminiscent of Leighton’s Mediterranean paintings, but too far away to have much effect on this scene. The young couple seen at the left appear to be staffage, and apparently lack any relationship with the priestess. John William Godward (1861-1922), Playtime (1891), oil on canvas, 50.8 × 41 cm, Private collection. Wikimedia Commons. The Playtime (1891) referred to in this painting is that of a kitten with a peacock feather, both frequently appearing in Aestheticist paintings. Much of the rest of the painting is then decoration and embellishment around that central scene, begging the question as to the role of the man and second woman. One of the few details shown on the building is an interesting echo, in the painted image of a peacock at the upper left. 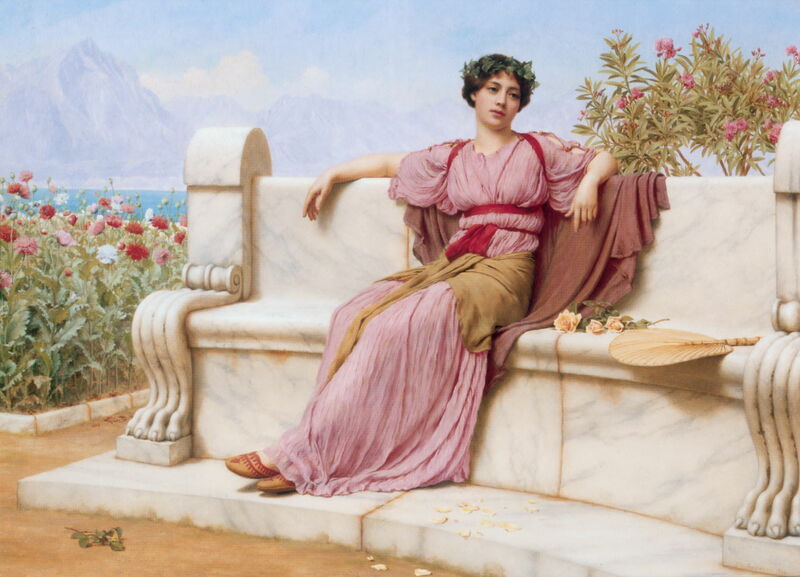 John William Godward (1861–1922), Far Away Thoughts (1892), further details not known. Wikimedia Commons. Far Away Thoughts (1892) is a beautiful portrait of a young model in thought, but lacks the power and symbols of Rossetti, for example. 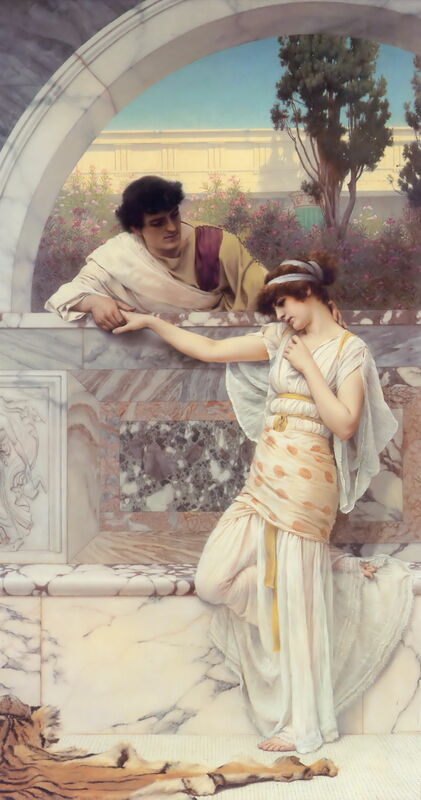 John William Godward (1861–1922), Yes or No (1893), further details not known. Wikimedia Commons. 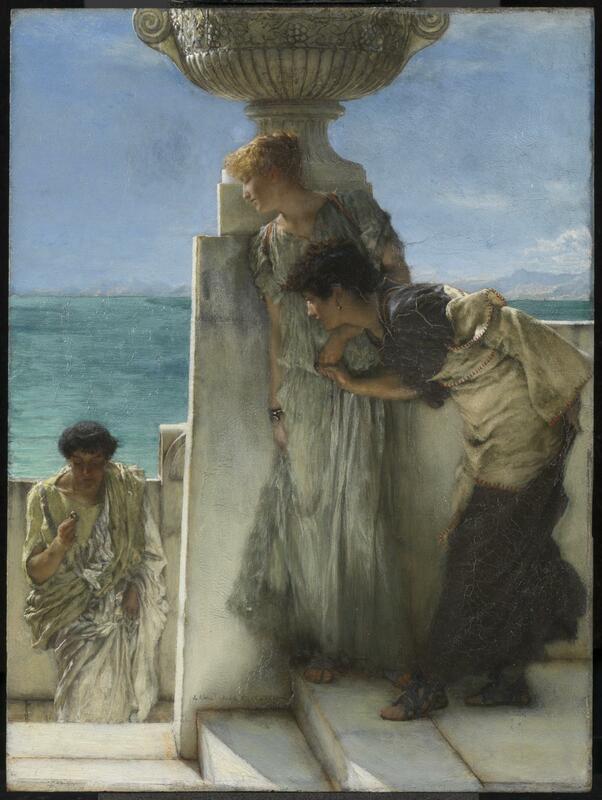 Yes or No (1893) assumes the popular theme of proposal of marriage, explored in the direction of gaze, but adopts an altogether blander approach to that of Alma-Tadema’s earlier A Foregone Conclusion (below). Godward reduces what might have been a simple narrative to a single binary question. Mischief and Repose (1895) is a little more complex, with two diaphonously-clad women idling away their time, one playing little tricks with the hair of the other. Godward’s marble has become more interesting here, and in parts threatens to overwhelm the figures. John William Godward (1861–1922), The Mirror (1899), oil on canvas, 80.6 × 37.5 cm, Private collection. Wikimedia Commons. The Mirror (1899) is an unusual painting, in that the viewer is not shown the reflection in the mirror of the title, only its reverse. 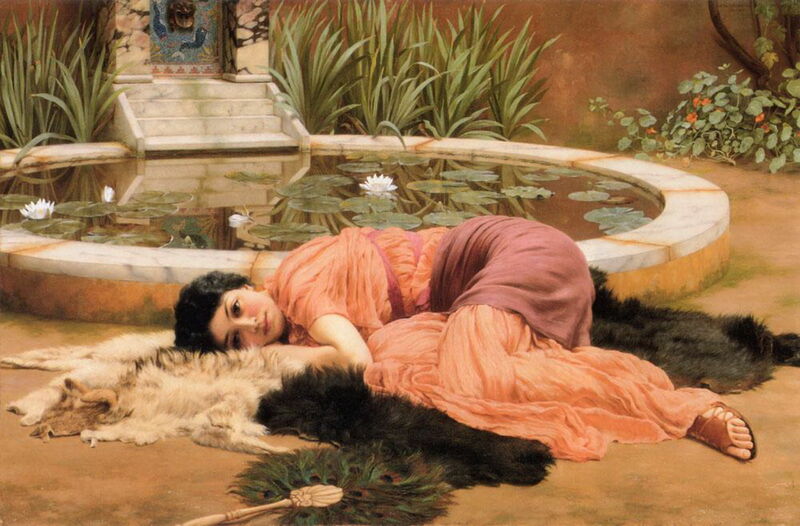 Dolce Far Niente (Sweet Idleness) (or A Pompeian Fishpond) (1904) is a popular title, applied to paintings by (at least) William Holman Hunt (1866), John William Waterhouse (1880), Lawrence Alma-Tadema (1882), and John Singer Sargent (c 1907) – the first three of which are distinctly Aesthetic. It is one of Godward’s more complex compositions, and probably his most famous painting, again featuring peacock feathers in a fan in the foreground, and a tricky set of reflections in the water. The latter do not appear entirely convincing in the steps, at least. 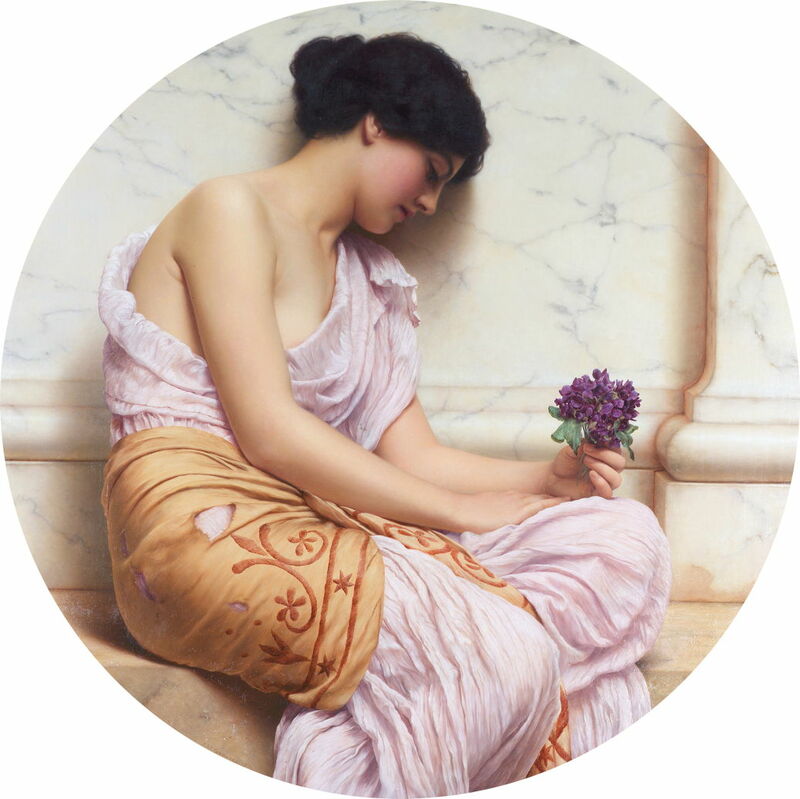 John William Godward (1861–1922), Violets, Sweet Violets (1906), oil on canvas, 92 cm diameter, Private collection. Wikimedia Commons. Godward continued to paint many single figures of women in thought, such as Violets, Sweet Violets (1906), and In Realms of Fancy (1911), below. In 1912, he left Britain to live in Italy with one of his models. His family consequently broke all contact with him. John William Godward (1861–1922), Tranquillity (1914), oil on canvas, 50.8 × 81.3 cm, Private collection. Wikimedia Commons. Tranquillity (1914) is exactly what it says. John William Godward (1861–1922), A Souvenir (1920), oil on canvas, 89 × 120 cm, Private collection. Wikimedia Commons. A Souvenir (1920) was one of his last paintings made in Italy. It could perhaps have been a ‘problem painting’, encouraging the viewer to speculate on its underlying narrative. 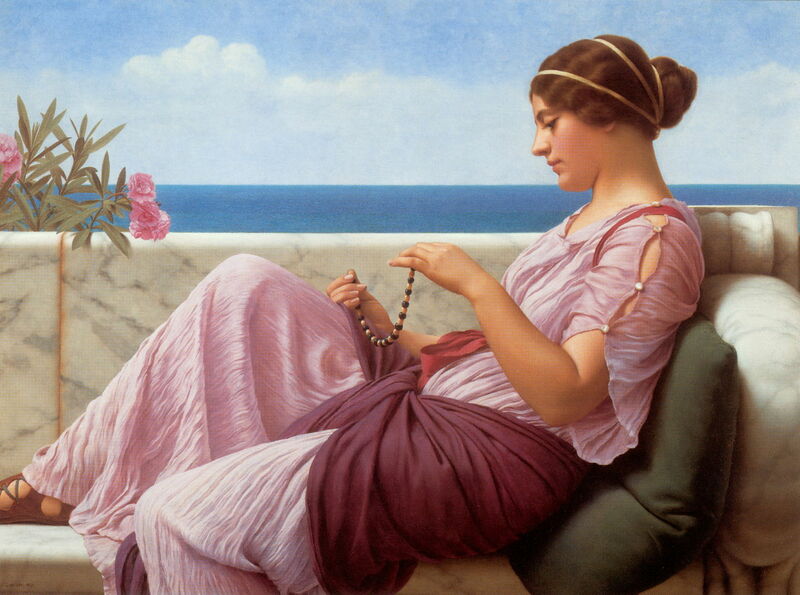 But Godward keeps it purely Aesthetic, in showing us the beads, presumably the souvenir of the title, and no other clues which could be used to read in any meaning – the goal of pure Aestheticism. Godward returned to London in 1921, becoming increasingly distressed about the advent of modernism, and of Picasso in particular. He died the following year, a suspected suicide. He is reported to have written a suicide note, containing the fragment “the world is not big enough for myself and a Picasso”. Inevitably, through the twentieth century his paintings were forgotten, and became almost worthless. In more recent years they have enjoyed a strong revival in popularity, thanks largely to the interest of a few private collectors, and prices have risen to exceed $1 million for his better works. Godward’s paintings undoubtedly have a sensory beauty, but I think demonstrate the dangers of dispensing with narrative, symbols, and readings: their beauty is transient, insufficient to hold prolonged attention. They are fleeting moments, static and generally both low in emotion and non-emotive. They look thoroughly nice, but that is all: they’re very good eye-candy. 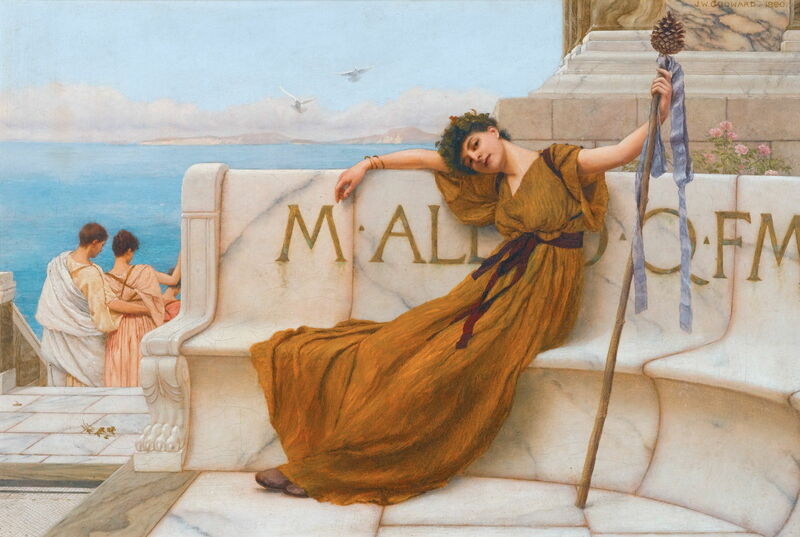 Posted in General, Painting and tagged Aestheticism, Alma-Tadema, Godward, Leighton, painting, Rossetti. Bookmark the permalink.